On one of my trips to the wineries in the North Georgia mountains, I had the pleasure of meeting an artist by the name of Marie Nease. I was instantly struck by her photography and how she was able to bring the vineyard to life on canvas. I was so struck by her work, I had to introduce myself and find out more about this talented artist. Several weeks later I was able to interview her. Marie Nease is an original Georgia peach. Marie grew up in Decatur, GA and had a happy, simple childhood. Marie is the proud mother of 4 grown boys. 1. How did you get started with your art? Marie was a recruiter most of her working career, however, in 2009 she was laid off and could not find another job. Marie purchased a professional Nikon camera and began capturing images. Marie is basically self-taught only taking continuing education classes at Gwinnett Tech. Marie’s father and grandfather were both photographers. Photography is in her blood. 2. How did you select the name Wingdreamer? Marie has a friend she met in 2000 at a house church. The friend, Cliff Trammel son of a former classmate. Marie is inspired by his outlook on life. Cliff is a very special person in Marie’s life. In 2004, on her birthday he read a story to her titled “Wingdreamer” which was about a butterfly and the struggles of metamorphoses. The story had a great impact on Marie hence the name Wingdreamer. 3. Why do you love vineyards? Marie shared that vineyards are beautiful, magical, and are always in gorgeous places. Marie compares vineyards to what Jesus says that he is the vine and we are the branches. 4. What is your inspiration? Marie feels her gift of photography is God given. Marie says that God inspires her and gave her the dream. Marie shared with me there is a metal container with birds where she keeps all of the things that inspire her. 5. What kind of wine do you enjoy? A wine that is not too sweet and not too dry. Marie has three bottles of her favorite wine Rommbauer. 6. What do you want to see more in the world? More inspiration and encouragement through photography and writing and more hope. 7. In one to two words describe yourself? 8. What do you want readers to know most about your work? Marie wants her work to encourage and inspire. 9. Where can people purchase your work? It was such a pleasure interviewing Marie. Marie truly has a gift and is able to bring her photography to life on canvas. Marie can even customize pieces for her clients. I was so moved by Marie’s beautiful work that I just had to share. My goal always is to bring the best offerings for our wine inspired lives. I certainly love this art and I am sure you will too. As the end of 2015 approaches, I like to look back over the year and determine what were the true highlights and what were some of my "firsts". Last month I attended my first Suwanee Wine Festival. The festival was held in beautiful Suwanee, Georgia at the Suwanee Town Center Park. A portion of the Suwanee Wine Fest proceeds benefit Annandale Village, a nonprofit organization dedicated to providing life assistance to adults with developmental disabilities and traumatic brain injuries. The festival may have been my first, but it will absolutely not be my last. I had an awesome time covering this event. It was a little overcast and rainy but even with the threat of inclement weather there was certainly a festival going on. As I walked around and spoke with each vendor, I discovered a great deal of diversity in each and every one. There was such a sense of community. I recommend to anyone try the VIP experience. Why? Premium wines such as Pierre-Jouet Sparkling Wine, Orin Swift Veladora Sauvignon Blanc, McKenzie Muller Cabernet Franc, Pico & Vine Cabernet Sauvignon - just to name a few. If you just want to go to the festival under General Admission, it is absolutely okay. The General Admission experience is still awesome. There were so many great wines to sample and vendor booths to visit that in my opinion the entire festival was a VIP experience. Some of my highlights include visiting Medieval Times, Sharp Mountain Vineyards, The Fresh Market, Sweet Acre Farms Winery and Explore Gwinnett. The food was also a delight. There were awesome food vendors such as Suwanee Pizza Tavern, Piece of Cake, Bistro to Go, and Bust'N Butts BBQ. There were major sponsors such as The Fresh Market, Atlanta Classic Cars, Suwanee Magazine, Tannery Row Ale House, Veugeler Design Group, and Ippolito's. You guys know the main goal of the "My Wine Life" Blog is to bring you the best in wine lifestyle offerings. The Suwanee Wine Festival was truly one of my favorite festivals all year. I had a great time. I would love to have you join me in 2016. Whose with me? Just had to share, I have found a great new wine product! The TRIbella™ wine aerator is a contemporary, sleek wine aerator that is in my opinion a piece of art. I quickly thought "what a great gift option" for a wine enthusiast. I received the TRIbella™ wine aerator to sample and was pleasantly surprised by the packaging. This aerator comes in its very own sleek black carrying case. The aerator itself has a modern design. I am adding this aerator to my top ten wine gifts of 2015. Now, I don't care how nice a product is or how great the design, if it does not do what it says it will do in my opinion the product is not creditworthy. I will say, this was NOT the case with the TRIbella™ wine aerator. This aerator provides a "perfect pour". I was so impressed as I opened one of my favorite bottles of wine and followed the directions provided. I was mesmerized by the very even flow of my beautiful wine through the three aeration streams. Understanding how important aeration is for red wine, I knew what this aerator was supposed to do. The aerator did just that! My wine was encouraged to open up and breathe by the aerator. I think the design is key to proper aeration this product provides. I am always excited to find a new great wine product to share especially when it has such a beautiful design. More importantly this aerator is a catalyst for making a good wine better. Again, if you entertain, are a wine lover, looking for an AWESOME wine gift or all three the TRIbella™ wine aerator is definitely worth it. I really love this product! Last weekend I had the awesome opportunity to visit a few North Georgia wineries. Now, for some that may not be a big deal, but I was born and raised in Georgia. Yes, I am a true Georgia peach. I am used to Georgia being synonymous with peaches and peanuts. One thing I and I suspect others are not used to Georgia being synonymous with is WINE. After this weekend not only do I associate Georgia with wine, I cannot wait for my next glass of these beautiful terroir driven wines. I would be remiss if I did not acknowledge how I was transported to these lovely wineries. VIP Southern Wine Tours (www.gawinetours.com). Let me say this was no ordinary hum-drum wine tour. I had so much fun! Captain Fireball guided my tour group through an afternoon of beautiful scenery, history, and great wine. I absolutely loved it and I will be taking a group of wine lovers back with me. 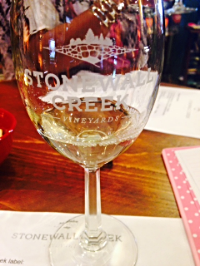 Situated at the base of the Blue Ridge Mountains, Stonewall Creek Vineyards has 5 acres dedicated to Cabernet Franc, Malbec, Petit Verdot, Cabernet Sauvignon, Tannat, and Petit Manseng. Upon arriving we were greeted by Michael Fisher aka Captain Malbec. Captain Malbec was a virtual encyclopedia of Georgia viticulture. I was captivated by the narrative he shared about Georgia wine history and its terroir. I was able to taste several wines all of which were amazing. There were two wines that rose to the top as my favorites the 2014 Boriana and the 2013 Norton. The 2014 Boriana was delightful. The wine is 100% Petit Manseng (Pe-teet Man-Seng). This full bodied white wine is fermented and aged in stainless steel. I immediately noticed lovely citrus notes and the wine had great acidity. I would pair this lovely porch sipping wine with poultry or seafood. The 2013 Norton, admittedly was a grape varietal I had not tasted before. The grape varietal is indigenous to the Southeast and Central US. The wine had an enriched deep ruby pigment, fruit forward, great acidity and very good balance. This uniquely vinified wine was a true gem. The wine had good structure which and would be great with lamb or beef. This lovely winery is nestled beautifully in the North Georgia mountains. The scenery around The Cottage Vineyard and Winery is absolutely breathtaking. We were fortunate to have lunch in this spectacular corner of the world. 2013 Chardonnay - Aged in French and Hungarian oak. This wine is full of tropical fruit, vanilla, butter, nuts. This full bodied Chardonnay would pair very well with a seafood dish. 2012 Cabernet Sauvignon- Also aged in French and Hungarian oak, this full bodied red is bigand bold full of black fruits, vanilla, and tobacco. It is delicious. 2012 Syrah - The Syrah was medium bodied with red and black fruits, baking spices, and nuts. I would love a little barbeque with this one. The owners of this lovely vineyard and winery were so welcoming. From The Cottage Vineyard and Winery we wen to Yonah Mountain Vineyards. The landscape on the grounds wer magnificent. Perfectly manicured lawns and beautiful flowers. I could not think of a better place to sip wine on a hot summer day. We tasted several lovely wines but the one that really made an impression on me was the red blend they call Genesis 6. This red is big and bold with lots of red and black fruits. There is just enough to add the round mouthfeel. The baking spices were detectable along with tobacco. A lovely blend indeed. A lovely vineyard dedicated to making great wines that are complex yet not complicated. I actually had the opportunity to explore the actual vineyard – it all starts in the vineyard. I was captivated as I peered down the row and rows of vitis vinifera. I peeled back the leaves of the first vine I approached to reveal a bunch of grapes waiting to be harvested. I thought about this bunch and the many bunches waiting to be picked and was delighted at the thought one day these grapes would make a great bottle of wine. Bernie’s is a quaint country inn coddled in the foothills of the North Georgia Mountains. We had a very special meal here. We were greeted by a pristine set table in the courtyard. I ordered the chicken and mushroom crepes- they were delicious. I paired my crepes with the Viognier which was a match made in heaven. I was given a tour of the inn which by the way, has its original kitchen. Room after room was filled with character. I am definitely looking forward to returning. Thank you for an amazing time. Let me end this post by thanking VIP Southern Wine Tours for an amazing time and the opportunity to experience the most beautiful scenery and amazing wines birthed by the North Georgia Mountains.